Today I’m going to share a cookie recipe with you. I kind of have a cookie fetish. Love making them. Love eating them. I always have a batch of frozen cookie dough balls (or cookies) in my freezer. You just never know when you’re going to need a cookie, and I like to be prepared! 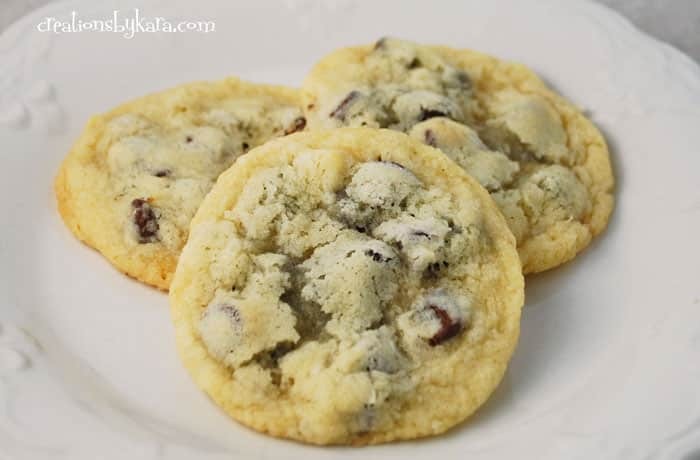 I tried this recipe for Coconut Chocolate Chip cookies last week, and they were a huge hit with my family. Next time I might try toasting the coconut first, because I love the taste of toasted coconut. Either way, these are fabulous if you like coconut and chocolate like we do at my house! Beat in eggs and coconut extract. Stir in dry ingredients, then coconut and chips. Drop by rounded spoonfuls on lightly greased cookie sheet. Bake at 375° for 9-10 minutes or till lightly browned. Thanks so much for having me Ashlee! I hope some of you will hop on over to say hello. I love making new bloggy friends! Don’t those cookies look terrific??? I’ve been craving baked goods ALL week, but can’t stand actually baking them. I wish Kara lived closer so I could head over. If you check out her blog she ALWAYS has some amazing baked good! Every week when I see her newest recipe I add it to my recipe collection. I don’t think she’s made a single thing I didn’t want to try! I remember the good old days when I had that too… I used to keep frozen cookie dough balls (I wish I had some right now) but my husband would eat them all (a quadruple batch) in a month and gained 60 lbs in just 3 months! So I had to quit doing that (Plus it totally made me all frustrated when I’d go to cook a few cookies and the batch would be gone! Grrr). Anyway, in addition to her amazing recipes she is also an incredible crafter! So drop by and give her lots of love! I agree! It doesn’t get much better than coconut! Congrats on your pregnancy! My husband does the same thing with pop. My Dr Pepper is always gone when I want one! Thanks for the recipe! Thanks for the congrats! I my snacks for myself and have to hide them so my husband doesn’t eat them. He doesn’t even like my snacks, he just likes snacking! So I try to keep snacks for him around. How many eggs are in this recipe? I am assuming 2 because Kara used them in plural form. I was planning on making these soon. Thanks! Did Kara ever get back to you? She told me you were right, 2 eggs- updated the post too. Thanks for the question!